MPR: Comey’s Lawyer, a Rap Mogul, and a Trump Subpoena? We see privilege issues discussed in judicial decisions, legal commentary, and mainstream news. 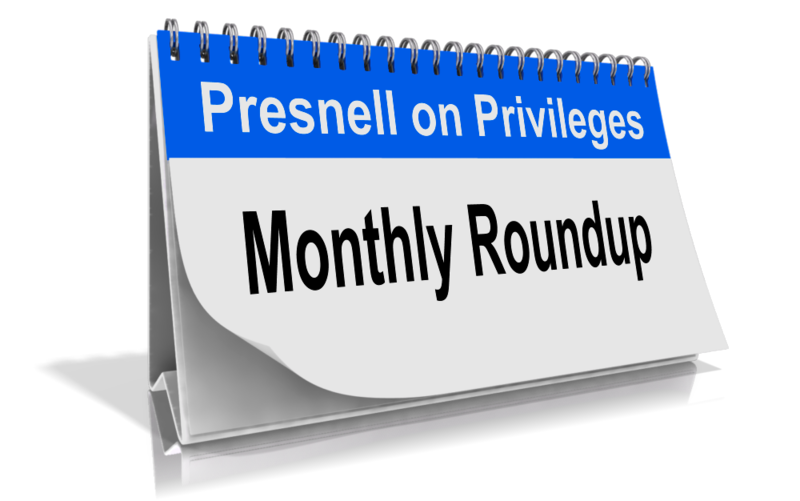 Here is my Monthly Privilege Roundup of interesting privilege issues for January 2018. →Special Counsel Robert Mueller wants to interview President Trump as part of the Russia campaign-meddling investigation, and may even subpoena him. If so, The Wall Street Journal, quoting yours truly, reports that Trump may rely on a D.C. Circuit opinion, In re Sealed Case, 129 F.3d 37 (D.C. Cir. 1997), to assert the presidential-communications privilege. Story here (subscription required). →Remember when Jim Comey provided confidential memoranda to his friend, Columbia Law Professor Daniel Richman, who in turn leaked the memos to the New York Times? Now Richman claims to be Comey’s personal attorney, which may become relevant in asserting the privilege to prevent authorities investigating the leaks from discovering any Richman–Comey communications. Story from The Federalist available here. →Authorities arrested and then released two lawyers for rap mogul Suge Knight for accessory to witness tampering. Knight, in custody and facing murder charges, would call a third-party who, in turn, conferenced in Knight’s lawyer. The trial judge permitted prosecutors to listen to these calls because presence of the third-party waived any privilege. The L.A. Times story is available here. →Speaking of jailhouse recordings, regular readers of this monthly roundup column know that I’ve relayed several reports of prosecutors and authorities recording conversations between lawyers and their in-custody clients. A Nebraska state senator has now introduced a bill to prevent any such recordings. Do we really need a statute to stop this practice? Read the Omaha World-Herald story here. →The Oklahoma Attorney General refuses to release an internal audit of the Lead-Impacted Communities Relocation Assistance Trust, citing, in part, the attorney–client privilege. The internal-audit findings reportedly implicate criminal activity regarding the cleanup at Tar Creek, a northeastern Oklahoma site formerly the home of a zinc operation. Will the privilege objection hold up to a public-records request? Story here. →The U.S. Customs and Border Protection agency issued a new directive governing cross-border searches and seizures of electronic device. The directive specifically includes new protections for those claiming that their electronic device contains privileged information. For a full report, see this article, with a link to the directive, from the National Law Review. →Another executive privilege claim, this time from Steve Bannon. Bannon refused to disclose certain communications to congressional investigators, citing the so-called executive privilege. Some (correctly) question whether Bannon can assert executive privilege over communications with Trump during the transition period. See the story from National Public Radio. For a discussion of General Sessions’ assertion of executive privilege, see this post.